What are bar codes?A bar code is simply a way of representing data through a series of machine-readable bars and spaces. When this pattern of bars and spaces is scanned, the elements that make up the symbol give a reflective (a space) or non-reflective (a bar) response that the bar code reader converts into a readable character code message. The characters that make up a bar code are not much different than the characters of the font that is used to display the words you are reading right now. In both cases, each character is signified as a dark shape against a light background and put together in a specific order, they form an intelligible message. The difference is that the bars and spaces that compose a bar code simply provide the easiest and most accurate format for recognition by scanning device. Bar Code SymbologyA bar code symbology is analogous to a type of language. Although there are many types of bar code symbologies in use, the three symbologies most often used for library systems are Code 3 of 9, Codabar and Interleaved 2 of 5. Many software systems can recognize multiple symbologies but some older systems require a specific type. Start & Stop CharactersThese are special characters found at the beginning and end of the bar code symbol that indicate to the bar code reader when the encoded message starts and stops. These characters are symbology specific and can be helpful in trying to determine what type of bar code is in use. 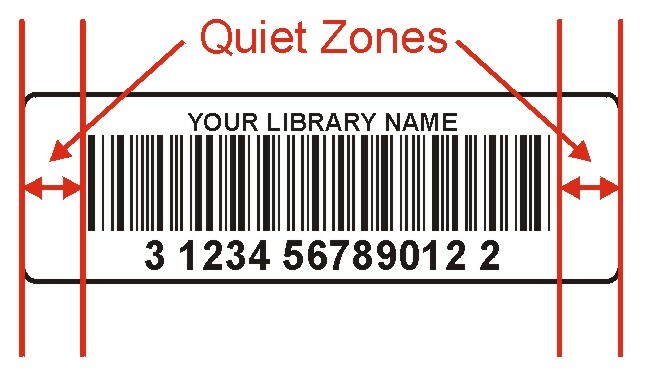 Quiet ZoneThe bar code’s quiet zone is a clear space, containing no dark marks, which precedes the start character of the bar code symbol and follows the stop characters. Scanners require quiet zones for successful decoding. The loss of the quiet zones due to poor alignment of the bar code on the stock or the misalignment of stock in the printer can make the bar code unreadable. Check DigitThe bar code check digit is a character (usually a number) included within a bar code symbol (usually the last number) which is used to ensure the accuracy of the read and validity of the number. This number is based on a mathematical algorithm generated from the other numbers in the bar code. Most libraries used a 14 digit bar code with the last digit being the check digit. Most libraries use a standard MOD 10 or a MOD 43 check digit. What is the required bar code type or symbology? What is the required start number? For new customers, please make sure there will be no duplication of numbers with your current inventory. For our existing customers, we manage the numbering ranges from previous orders in order to avoid any duplication problems. What is the total number of characters in the bar code? Is there a check digit? If this is not a standard check digit, what is the check sum algorithm? Are there any special requirements or formatting? What label item type do you require? ie.) Singles, Pairs, Two-Part. Please ask for assistance or a copy of our product guide if you are unsure of our item number. For new customers, please supply a sample of a current bar code label. We can generally determine all the necessary information with a clear sample that shows at least 4 bar codes. A scanned and emailed sample is preferable but a faxed or photocopied sample is also usually fine as long as it is as clear and as large as possible. We are happy to provide a PDF proof of the bar codes prior to production for testing upon request. The proof can be printed on a decent laser printer and then scanned and tested for compatibility with the library automation system and to ensure no number duplication problems.